Age relaxation go.264, Maximum age limit go.329, State and subordinate service rules, TS Direct recruitments, Uupper age limit raised to 10 years, TSPSC recruitments, DSC TRT recruitments, TSPSC TRT Recruitments, Maximum age limit is 44 years, police, excise, fire, prisons, forest departments. The Government has made a decision to extend the age limit of ten years for job recruitment. The Government has extended the age limit for another two years. The Government has issued an order to extend maximum age limit to the Public Service Commission and other recruitment agencies to 44. The maximum age limit extension of 44 years will be implemented until July 2019. Much to the joy of government job-seekers, the State government has raised the upper age limit by 10 years for ensuing direct recruitments through Telangana State Public Service Commission (TSPSC) and other recruiting agencies. A notification was issued on Tuesday by Chief Secretary SP Singh on behalf of Governor ESL Narasimhan, raising the upper age limit from 34 years to 44 years for all direct recruitments except uniformed services. The State government had issued similar orders in July, 2015, which was renewed again last year. However, the State government has extended these adhoc rules which expired on July 26 this year. Considering the pleas from government job-seekers, the State government has decided to extend the orders for further two years period. 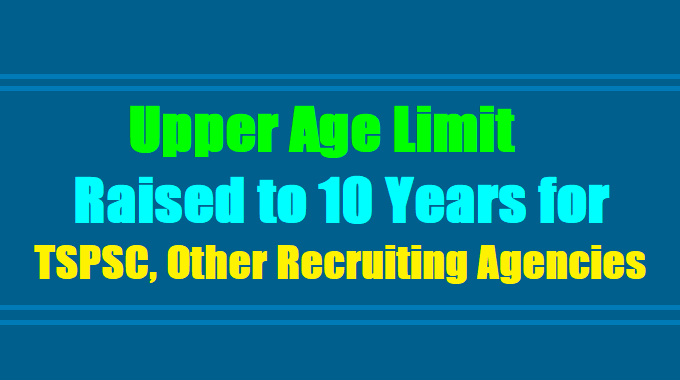 The adhoc rules of upper age limit, will be applicable to various categories of posts to be notified for the purpose of direct recruitment by TSPSC and other recruiting agencies in the State. Thus, the age concession over and above the upper age limit should be allowed in accordance with the Rule 12 of the State and Subordinate Service Rules. However, these rules are not applicable for direct recruitment to the posts of uniformed service including Police, Excise, Fire, Prisons, and Forest departments. PUBLIC SERVICES – Direct Recruitment – Raising of Upper Age Limit by 10 years for the ensuing recruitments through Telangana State Public Service Commission and other Recruiting Agencies –Further extension - Orders – Issued. 1. G.O.Ms.No.329, G.A (Ser.A) Department, dt: 27.07.2015. 2. G.O.Ms.No.264, G.A (Ser.A) Department, dt: 26.07.2016. 3. From TSMEWA, Hyd. Repn. Dt. 22.07.17 and others. ORDER: In the G.O.1st read above, orders were issued making an Adhoc rule for extending the maximum age limit prescribed in the General rules for appointment by Direct Recruitment through TSPSC and other recruiting agencies from 34 years to 44 years, for a period of one year from the date of issue of the said G.O. 2. In the G.O 2nd read above, an amendment was issued to G.O 1st read above extending the maximum age limit for further one year i.e. upto 26.07.2017. 3. In the reference 3rd read above, certain Associations and unemployed youth have requested for extension of orders issued vide reference 2nd read above for a further period of Two years. 4. Government, after careful examination of the matter, hereby decided to extend the upper age limit prescribed in the Adhoc Rule issued in G.Os. 1st and 2nd read above for a further period of Two years i.e. up to 26.07.2019. Notwithstanding anything contained in the State and Sub-ordinate Service Rules or in the Special or Adhoc Rules for any State and Subordinate Services, the maximum age limit prescribed in the said rules for appointment by direct recruitment shall be raised by “Ten Years” i.e., from 34 years to 44 years for a further period upto 26.07.2019 to the various categories of posts to be notified for the purpose of direct recruitment by TSPSC and other recruiting agencies in the State. The age concession over and above the upper age limit shall also be allowed in accordance with the Rule 12 of the State and Subordinate Service Rules. Provided that nothing in this rule shall apply for direct recruitment to the posts of uniformed service viz., Police, Excise, Fire, Prisons, Forest Departments etc., for which physical standards have been prescribed in the State and Subordinate Service Rules or in the relevant Special or Adhoc rules. GO.Ms.No.329 Date: 27.07.2015.: GOVERNMENT OF TELANGANA, GENERAL ADMINISTRATION (SERVICES-A) DEPARTMENT, PUBLIC SERVICES - Direct Recruitment - Raising of Upper Age Limit by 10 years for the ensuing recruitments through Telangana State Public Service Commission and other Recruiting Agencies - Orders - Issued. Government has been according top priority for filling vacancies in Government Departments by direct recruitment to provide employment opportunities to the educated youth, consequent on formation of State of Telangana. Clearances are also being given to the TSPSC and also other recruiting agencies for notifying the vacancies. 2. A number of representations have been received from unemployed youth, and also from the public representatives for considering relaxation of upper age limit for direct recruitment to enable more unemployed youth to become eligible to compete in the recruitment Process and the matter has been referred to the Cabinet Sub-Committee constituted – vide G.O. 2nd read above and the said committee reviewed the matter and made certain recommendations. GOVERNMENT OF TELANGANA-PUBLIC SERVICES - Direct Recruitment - Raising of Upper Age Limit by 10 years for the ensuing recruitments through Telangana State Public Service Commission and other Recruiting Agencies for a period of one year - Further extension - Orders - Issued. Read: GO.Ms.No.329, G.A (Ser.A) Department, dt: 27.07.2015. ORDER: Government, after examination of the matter, hereby decided to extend the time limit prescribed in the Adhoc Rule issued in G.O. read above for a further period of one year i.e. up to 26.07.2017. In the said Adhoc Rule, for the expressions “for a period of one year” shall be substituted with the expressions “for a period of two years”.